Yoga has a cluster of techniques distributed through a variety of branches. Their objective is the same: to experience oneness with the underlying reality that is the basis of the external word. Though they aim for the same goal they use different approaches for their journeys. In India, the most ancient practices do not request any sweating. In the West the manipulation of the body and the breath are the most used tools in a yoga practice. Hatha Yoga is the mother of this branch and its scriptures date from around 10th to 18th century. Around the 20th century, great Indian Yoga gurus like T. Krishnamacharya, Iyengar and Patabhi Jois made popular different styles of practices that fall under this branch of Yoga. These practices – iyengar, ashtanga vinyasa and its derivations – are certainly what usually come to a westerner’s mind when they think about Yoga. In India, besides Patanjali’s yoga (Raja Yoga), Yoga is widely associated with the cultivation of the right attitudes towards the world and inside us. 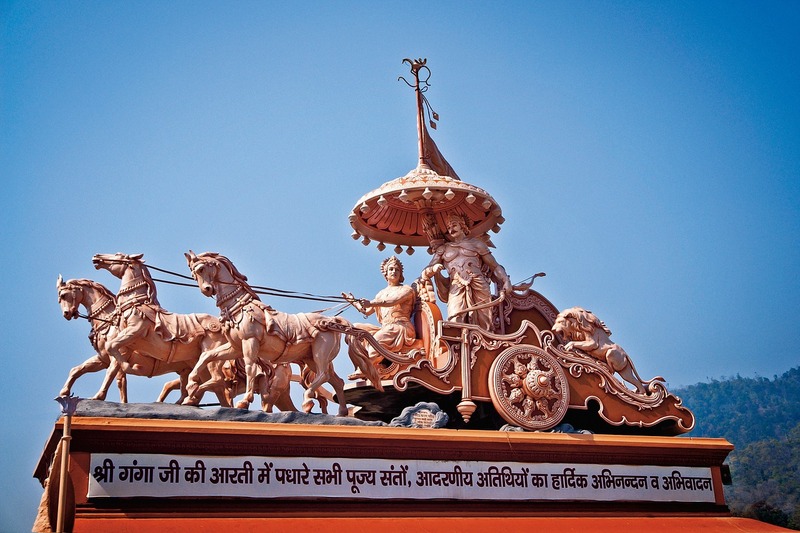 These paths are beautifully articulated in the Bhagavad Gita (Lord’s Song). Lord Krishna delivers essential spiritual teachings about the nature of the Universe and the different yogas to Arjuna, a known warrior. The word bhakti comes from the Sanskrit root bhaj, which can be translated as adore or worship. Bhakti Yoga is about cultivating an attitude of devotion towards a deity or higher consciousness. However, God can be seen in everything, everyone, everywhere and in every context. In this sense, Bhakti Yoga is about cultivating an open-heart and a refined love for all beings: a non-personal love that through practice and surrender becomes capable of full acceptance. That is surely the expression of divine love. Through loving in Bhakti Yoga we experience oneness with our true self and with everything. One of the known practices in Bhakti Yoga is the chanting of devotional songs or kirtans. Karma has many meanings. In this context we can translate it as simply action, deed or work. It has been broadly associated with the work done through NGOs. However, though there is no doubt that selfless actions can be practiced once we work for the service of others. The essential practice of Karma Yoga is the practice of detachment from our actions’ and its consequences or results. These are powerful ways of acting in yoga because they eventually purify our minds from our narrow ego’s perspective as we slowly open up to experience liberation. “Fools say that knowledge and yoga are separate, but the wise do not. Jnana is defined by the Sanskritist M. Williams as becoming acquainted with the higher knowledge, the one derived from meditation on the Ultimate Reality. It’s about cultivating the right knowledge and discrimination. Discrimination is quite different than judgment. Judgment is bound to our past conditionings and our expectations towards reality while discrimination is seeing things plainly for what they are. But, how can we differentiate those in practical terms? That’s exactly a big part of this practice! It guides people to live and act by understanding what is eternal. Once we are able to understand that we become able to discriminate and slowly become one with our eternal essence – by practicing to live by its perspective. All these paths eventually complete each other: discriminating is connected to acting selflessly and cultivating a loving attitude. However, each of those paths is easier to different individuals at least at first! Bhakti Yoga is generally a natural path to the predominately emotional people; Jnana, to the intellectual characters and Raja, to the more active ones. In any case, whether we choose to pursue a physical path or not, the important fact is surely to keep yoga’s essence in perspective, in our hearts and, if that is our choice, on our mats.